Let’s be frank – the economy is in the crapper. We’ve been tightening our belts despite what the administration wants us to do. It’s bad enough they are using my tax dollars to take care of the messes of other people, but don’t expect me to voluntarily put my own family at risk to “do my part to stimulate the economy” by spending any more than I need to. I’m done with that soap box. I’ll get back to the real story. We like to get Chinese take-out on occasion, but since we’re tightening our belts, Hubby’s decided to attempt making his favorite menu items at home. Some of the ingredients are not found in your average, every day grocery store. Fortunately, there are some Oriental grocery stores in the area. There is an “East Oriental” grocery on Olive Blvd, but the “East East Oriental” grocery was closer to his office. I guess that naming philosophy is on par with the 1st Baptist Church of X Community. I’ve never seen a 2nd Baptist Church of X Community (although there is/was a 3rd Baptist Church down on Grand Ave). If another Baptist Church is building in the area, it seems they find some way to make it a “1st” Baptist Church. There could be a 1st Baptist Church of X Community, 1st Riverside Baptist Church, and 1st Family of God Baptist Church all within a mile of each other. The important thing is that they are the “First”. The variety of rice was almost overwhelming. But the sheer quantity of rice was over the top. There were bags of rice as big as the 25lb Purina Dog Food bags! Everything seemed so bizarre – there were oodles of rice cookers and five pound bags of crushed red pepper (I think the bottle we have in the spice drawer is more than a year old and that’s only one ounce). 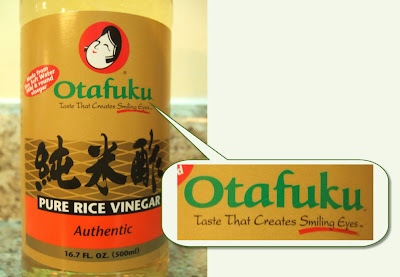 One hard to find ingredient was pure rice vinegar. After sweating it a bit, the East East Oriental grocery store did not disappoint. They had one brand of pure rice vinegar. He swears up and down that he did not pick this one out on purpose, but that it was the only one available. First, I would like to point out the red oval with the “this-is-why-I’m-so-special” wording on it. 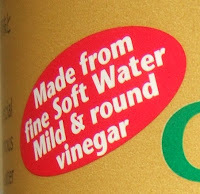 “Made from fine Soft Water”: I understand this. Soft water is devoid of pesky minerals that can affect the taste. But, why is soft water capitalized? Is that a brand of water? I have soft water in my house, but I don’t ask my friends if they would like a glass of “Soft Water” like I would if it were a bottle of Aquafina. “Mild & round vinegar”: This I don’t get. What the hell is “round” vinegar? Now, sound out the name. All I can say is if it is that good, maybe we shouldn’t keep it in the kitchen. God Bless my husband for taking our budget seriously. Making it at home is almost always cheaper. We should all take a multi-cultural field trip once in awhile. This experience reminded me of the time I went into a Mexican grocery store, and they had fried pork rinds the size of a small child. Just when you think you know it all, you learn something new. Did you know there are instructions on the side of the Arm & Hammer baking soda box for making a fizzy “drink” to relieve heartburn? Well, there is. I’ve pretty much only used baking soda to bake, clear a stopped up drain and make corks pop off test tubes. These are the things you learn from a friend who has more life experience than you. And more guts! At a recent lunch, my friend was relaying her weekend experience with heartburn. Her problem was getting the gas out. The last (and only) time I had it, I kept belching up the gas – that was disgusting! I think I’d rather deal with her problem. She had made a chuck roast for dinner and her & her husband ate somewhat late. A few hours later, the heartburn started, and she couldn’t get a belch to come up (guys don’t have this problem; they are taught the “art” of belching on command in elementary school). When she couldn’t stand it any more, it was time to look some for relief. To the medicine cabinet! There were no Tums, no Alka Seltzer, no Rolaids, no Pepto. To the kitchen! Ah, ha! Here, we had some options. The first option was a bottle of white soda still sitting around from Christmas. However, it may or may not be fizzy. The second option was the huge box of Arm & Hammer baking soda near the stove. According to my friend, she keeps it close to the stove so it is handy for cooking and in case of a fire. The box was almost empty (she must have a lot of fires), but she checked the side of the box to see how much baking soda to use in water to make a carbonated drink. In reviewing the side of the box, she noted there were precautions regarding the interaction between the baking soda and certain types of medications. It didn’t list any medications, and it was too late to call her doctor to find out. She looked at the bottle of white soda again. Then, she went to the refrigerator to see if there was anything all the way in the back. I’m sure there was lots of stuff in the back. There’s plenty of green stuff in mine that would make you feel worse than the heartburn. But, hey, you wouldn’t be worried about the heartburn any more. There still wasn’t anything that would work in the fridge. How about the pantry? Nope, nothing there. Back to the baking soda. She must really hate white soda for the baking soda option to look more appealing. She looked at the box again and thought the likelihood of there being an interaction between the baking soda and the medications she was taking were pretty slim. However, now she made a new observation. The expiration date on the box was well past – like, two years past. Making a baking soda & water drink was no longer an option – never mind that she’s been using that same baking soda in recipes and feeding it to her family. The only thing left was the white soda. She shook the bottle (yah, wise idea when you might need to open it in a second) and fizz appeared. Relief at last! She would have been back to bed so much sooner had she done this first. I guess this revelation is just one more of those life experiences she can pass on to us younger folk. 1. Home remedies are almost always cheaper than store bought meds. I wonder if this would work with Crystal Light. I’ve heard it counts as intake of water. 2. Try the simplest solution first – shake the bottle (gently). Fizz = good, no fizz = not so good. 2 Readers laughed with me today. If you chuckled, let me know by leaving a comment! After we finally got Cupie’s first tooth out (click here read that story first), we had to prepare for the tooth fairy. We got out her plastic tooth holder (it’s about half an inch high, looks like a tooth & has a cap that snaps on) and put the tooth in. She was having a grand time shaking the tooth holder and making a generally annoying noise with it. We headed directly down the hall to get tucked into bed for the night. I got Ellie in her bed first, and then I went across the hall to Cupie’s room. 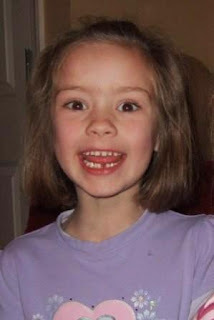 I could see her chin quivering and as soon as she opened her mouth, the tears started flowing – she lost the tooth! She had the holder, but the tooth was gone. She swore up & down that she didn’t open the holder and it was still in the holder when she left my bedroom. She was sitting on the bed so we stripped the bed – nothing. I needed to pull the trundle out, but first I had to clear some space on the floor. I shook each stuffed animal, blanket, rug, Barbie doll, slipper, book, & kitchen sink in the room before moving it out to the hall or the closet. With the trundle out, I lifted the mattress and each slat – still nothing. I got out the cordless sweeper. At least it had a little dirt collector we could sift through. I swept up every loose carpet fiber and any other bits & pieces on her floor. Then I got a trash can and made her help me sift through the stuff. We found beads, stickers with no sticky, a Barbie shoe, and (super gross) a toe nail clipping. Still no tooth. I’ll have to make my way backward – to the hall! We put the bed back together and brought in the stuff from the hall; shaking it all out again just in case. After sweeping the hall, we went through the sifting ritual again – no tooth. I finally made my way back to my bedroom. After moving Rob’s pile of dirty clothes, several receipts he accumulated on his nightstand (the pocket emptying ritual), and a pair of shoes, I found the tooth wedged up against the foot of the nightstand. Hmmmm, didn’t she swear it was in the tooth holder when she left my room? Must be a magical tooth – it can disappear out of a closed box and appear somewhere far from the location of the disappearance. David Copperfield should include this tooth in his act. Maybe I’ll write him a letter. Better yet, I’ll find his e-mail and just send him a blog link – I’m sure he personally reads all his e-mail and opens every attachment and web link included in the e-mails. NOT! Since the tooth disappeared once already, I now had a dilemma. Cupie’s bed is right up against the wall and there is a trundle under it. If the tooth rolls out from under her pillow behind her bed, there is no way I was going to be able to play Tooth Fairy without waking her up. My solution was to put the tooth under her pillow, but inside the pillowcase. This really worried Cupie. What if the Tooth Fairy couldn’t find it? Apparently, that pesky pillowcase would be in the way when the Tooth Fairy slid her hand across the fitted sheet & under the pillow. There would be no tooth! Cupie wanted me to write a note for the Tooth Fairy telling her exactly where the tooth was. It had to be taped to her bedpost right by her pillow. That's just what I wanted to do – stick scotch tape on her wood bedpost. I went all the way down to the kitchen to get out a pad of paper to write the note. This was an adventure. The little notebook I keep in the junk drawer had notes on almost all the pages. I had to flip through page by page (by this time it is past 9:00 and I had TV to watch!) until I found a blank sheet in the middle. I must have a tendency to start at the beginning or the end when grabbing it for notes. I don’t rip out the pages until they are used up on both sides – call me frugal, I don’t care. MY TOOTH IS UNDER MY PILLOW, BUT IT IS INSIDE THE PILLOW CASE. She signed it herself – I wrote the rest. We would have been there until 10:00 had I let her write the entire note. She was finally happy with the tooth situation and crawled into bed. At about 1:00 I snuck into her room to put the golden dollar under her pillow and take the tooth to a super secret spot. Since the tooth was in the plastic holder, I had to take it out of her room to open it. I didn’t want her waking up to find me standing there with her tooth & money. That would be just great – ruin the magic on my first Tooth Fairy adventure. I snuck back in her room and left the plastic tooth holder & money under the pillow (in the pillowcase, of course). When I got up in the morning, Hubby asked if I had taken the note. Doh! I had forgotten. Unless I wanted to put up the note every time she lost a tooth, I had to go get it. For the third time, I entered her room. I snatched the note and hoped I didn’t wake her up. This was supposed to be an in and out operation. Instead I had to risk my daughter’s happiness and my sanity three times. Next time we won’t have the note issue. Cupie thinks the Tooth Fairy took it to put in her file for future reference. We’re going to have to do something about that tooth holder, though. Silver lining: Cupie was so excited Tuesday morning. It sounded like a buffalo running down the hall. She turned the corner into our room with her hair flying and the biggest smile I’ve ever seen on her face. That alone was worth all the hassle. Three weeks ago, we discovered Cupie had a loose tooth. It wiggled just a little bit, but it was definitely loose – not our over active adult imagination about getting to see your child’s next milestone. An urgent plea went out to all I knew who had school age children. What’s the going rate???? Turns out, it’s a dollar. Some people do something special for the first tooth, but Cupie would have been disappointed when the next tooth came out and the Tooth Fairy didn’t perform as well. One of the responders said they had heard of $20 a tooth! What?? That’s a mouth worth 400 bucks. Their baby teeth are precious, but there is no way they are worth that much; especially when those first few teeth come out in quick succession. Anyway, it took three more weeks so I guess I didn’t have to go into over-drive about the amount. She’s reached another milestone in this great game of life. For me, it is a double edged sword – I’m excited for her, but sad for me. Another piece of my baby is gone. That’s enough sap – on to the funny stuff! So on Saturday, Cupie says she really wants her tooth to come out. I told her that she needed to have patience and it would eventually come out. But she started whining about how it was bothering her so I steered her toward the bathroom. I didn’t want her bleeding all over the carpet (as if tooth paste wasn’t bad enough – blood would really leave a mark). I told her to start wiggling the tooth hard, but she was being a total wuss about it. “Do you want me to try?” I asked her. She nodded her head and I tried to get a grip on it to pull and/or twist. That got a yelp and tears, but there was blood so I accomplished something. What kind of mother am I? I made my child bleed – yay! After she calmed down a bit, I asked her if she wanted me to try again. She really wanted that tooth out so she agreed. The tooth is too small to get a finger grip on so I had to consider my options. I’ve heard in the olden days, they tied a string around the tooth, attached the other end to a door, and slammed the door to get the tooth to pop out quickly. There are three things that prevented me from choosing this option. (1) I’m sure Cupie wouldn’t go for a string in her mouth nor do I think she would sit still long enough for me to tie it on. (2) Say I'm wrong about #1 and the tooth comes flying out and gets lost. (3) Again, say I'm wrong about #1 and it wouldn’t work and she’d hate me for the pain I inflicted. Next option, get the needle nose pliers to get a better grip on the tooth. This was dismissed – you ever accidentally get the metal from a tool in your mouth? It’s bitter! Besides, if it didn’t work, I’d probably damage the enamel and with my luck, the tooth wouldn’t fall out until it rotted out. I decided to go with just a good pull. I hooked my index finger over the tooth and quickly contracted my finger while pulling with my arm. I heard something pull loose, but didn’t come all the way out. I got a full blown scream and a ton of tears. She wouldn’t let me anywhere near her mouth after that. She eventually calmed down because she had a new game to play – let’s push my tooth out with my tongue, then pull it back in! The things that delight a five-year-old (insert your own eye roll here). This little game went on until Monday when she was playing with her tooth and it just fell out. Finally! That saga is over. Now, we had to prepare for the tooth fairy. . .
1. Her teacher at pre-school was kind enough to put the tooth in a sealed envelope instead of letting Cupie hold on to it. 1 Reader laughed with me today. If you chuckled, let me know by leaving a comment! We had Ken, Roxie & their girls over for dinner recently and the girls wanted to watch it. I decided, “Whatever. Never mind that Christmas was two months ago.” And turned it on. Even though they like the movie, they quickly got distracted and were off to play dress-up. Did we turn the movie off? No way! All the adults can almost recite it line by line – it’s a great movie! We all have our favorite part. Mine is “The Leg Lamp”. Now, if you’ve never seen the movie, you are truly missing out. Never the less, I’ll fill you in. The Old Man (he isn’t given a name, he’s just “Old Man” – really, that’s how it is in the credits), gets notification that he has won a major award. He has no idea what it is, but he’s ecstatic none the less. When it finally arrives, it’s in a crate labeled “Fragile”. Old Man pronounces it “Fra-GEE-lay” and thinks it’s something Italian. Anyone who has seen the movie knows what it means when someone describes an item as “fra-GEE-lay”. Old Man opens the crate, digs around, and pulls out a lamp. A lamp sounds harmless enough, but this is a life-size plastic leg, complete with a high heeled shoe and fishnet stockings. I could see how this would be something Italian – Italian whore house maybe, but Italian. The lampshade accompanying the lamp is black with fringe on it – I think it is supposed to look like a skirt. That same line is repeated in our family (we replace Parker with Covey). You see, I have my own leg lamp so to speak. Some time ago, Hubbys’s mom gave him a boot Christmas ornament. That first Christmas together, I opted not to put the boot on the tree. It didn’t fit the “theme” I was going for (mostly Disney ornaments), and at the time, it wasn’t really my taste. This happened for a couple of years before Hubby actually asked me about it. I explained, but he insisted it go on the tree. Fine. A year later, when we got out the Christmas decorations, the boot was in the ornament box – BROKEN! I could swear up & down that I did not break it, but Rob would not believe me. I got away with leaving the broken boot in the box for a couple more years (he wouldn’t let me throw it away), before I finally got out the glue. We had had glue for quite some time as I had not used it all up on purpose. Why he didn’t get the glue out himself, I just don’t know. After repairing the boot with great care, I was going to place it on the tree. By now Disney was not the theme because we had slowly acquired several bright & colorful non-Disney ornaments. I start out placing ornaments here & there haphazardly. As I get further along, I fill in bare spots. It just so happened there was a bare spot on the side of the tree. Of course, this was the perfect spot for the bone of contention, “The Boot”. Boy did I get an earful for that! He insisted that I move it to front & center – to prove forevermore that I did not break the boot on purpose. Now, it’s an annual game – to him. He watches me put up ornaments every year and always reminds me to put up the boot – front & center. Considering he doesn’t help put up the Christmas ornaments, I’ll tell you where I’d like to stick a boot (but not “The Boot”) – backside center! 1. I have grown to appreciate the boot over the years. I only pretend to not want to put it in the front. 2. We have one of the weirdest Christmas traditions. 3. Hubby at least helps me get the tree & decoration boxes out of the basement - the tree is heavy! WARNING - May contain graphic content (if you have your mind in the gutter)!! The 2008 football season is finally over!!!! I may have been raised in Green Bay, but I am not much of a football fan. That’s a feat all in itself. You are bombarded with football references every day, every place you go. Merchandise is available statewide and business three hours away still use “Packerland” in their names or “Home of the Packers” in their tag lines. Living in a suburb of Green Bay, the Packers are even more prominent. Players lived in the condos behind our house and went through my check out lane in the local grocery store. My high school colors were even green & gold. For many Wisconsin babies, their first words are, “Green Bay Packers”. I will always be a Packer fan – it’s a requirement; otherwise, I will lose my inheritance. That doesn’t mean I have to actually like the game. You would think the Superbowl would be the close of the season, but I guess the Probowl has to be held afterward. I suppose no one wants to get hurt in a “for fun” game right before the “BIG” game. We didn’t watch the Probowl because we forgot it was on (after the Superbowl, who thinks of football anymore? ), but we did have a Superbowl party. I was trying to host an impartial party. I made sure I had a balloon bouquet for each team. Each one had a mylar football – the Steelers had black & gold latex; the Cardinals got red & white latex. How gay is that – a football party with balloon bouquets? That was the extent of my decorating specifically for a football game and I had bouquets???? Good grief! I, the impartial one, also made sure I was wearing a black shirt and a red bracelet. Actually, that just kind of happened but it worked as an example of my impartiality. At one point someone made a comment about taking my shirt off if the Steelers started losing. Sorry guys, I had on a black bra too – I was committed to being impartial. Some people might think I just need to be committed, but that’s a whole other story. With Kurt Warner’s St. Louis history, I really felt obligated to rooting for the Cardinals. Besides, almost everyone else was rooting for them. Mike was one lone Steelers fan. Fortunately, he had changed his underwear that day. Apparently, he had been red underwear the day before. I’m sure he wouldn’t want to be labeled a flip-flopper or a fair weather fan. Had he been found out, I guess he could have gone with the ‘wardrobe malfunction’ argument. Ah, all was well – he made clothing choices that suited his best interests. Good times, I must say. Especially, when there is plenty of penetration. That was the word of the night. Honestly, John Madden had to have said it about every frickin’ play. If we had known and made a drinking game of it, we all would have been three sheets to the wind before the end of the first quarter. It’s that kind of insight that gets John Madden the big bucks. I mean, no kidding, you need a play that will score some points? Is that how this game goes? I guess if there is penetration, you will score. 1. While the final score was Steelers 27, Cardinals 23, Hubby won 25 bucks in the office pool. 2. I popped the Steelers balloons and tied them to Mike’s car a few days later – that felt good!